 The first significant study of concentration camp resistance to focus on the political dynamics of inmates of varying nationalities and classifications. Langbein, a former prisoner who led an international resistance movement at Auschwitz, has interviewed scores of survivors to analyze the resistance movements of the major concentration camps (not those of the ghettos or transit camps). Translated from German, this study has a long-overdue emphasis on non-Jewish inmates. These prisoners, while a minority, were more active in resistance because they were less starved, more nationalistic, and, being largely single men, less encumbered by the threat of reprisals. The major inmate divisions are referred to by the colored triangle on their camp garb. Reds were political prisoners (from Spain to Czechoslovakia); Greens, the mostly German and Austrian criminals; Violets, Jehovah's Witnesses; Yellows, the predominant Jews (whose two triangles were sewn into stars); and Blacks were Gypsies, prostitutes, and other ``antisocials.'' The Reds were the best organized and motivated rebels, most able to sustain an underground movement despite betrayals and the savage reprisals that followed escapes and uprisings. Despite infighting between Reds (later dominated by Russians) and Greens, German inmates are seen as especially crucial in the Buchenwald resistance movement. The unpopular German inmates often had to deal with ``enormous spiritual conflicts,'' which resonate in their recorded testimony. Only at Mauthausen, the last camp to be liberated, were prisoners able to obtain weapons from the retreating Germans. The Spanish contingent, which led the resistance along with some Czech, German, and Russian cells, was so organized that American soldiers arrived to see their large banner draped over the camp gates: ``The Spanish anti-Fascists greet the armies of the liberators.'' 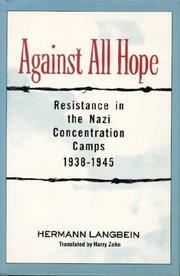 Inspiring and informative, this book fills large gaps in what we know about resistance in the concentration camps.